C111 was the designation of the futuristic study displayed by Mercedes-Benz in September 1969 at the Frankfurt International Motor Show (IAA). The car broke new ground in terms of both engineering and design. Motor show visitors crowded around the sports car, marveling at its intriguing – as well as polarizing – design. Was this the worthy successor to the famous 300 SL Gullwing? The car’s style, dynamic lines and classic gullwing doors promised just that to lovers of refined cars with the three-pointed star on the hood. In the spring of 1970, an even more elegantly clad C 111-II made its appearance at the Geneva Motor Show, prompting interested parties to send blank checks to Stuttgart to secure one of these cars for themselves. And this is the version you see here. However, it had never been planned to produce the new Gullwing, and the C 111 was not to appear in showrooms. The coupe may have looked like the systematic further development of the Sport Light models from the 1950s, but it was not a design study for a new SL: it was to serve as a purely experimental car. Mercedes-Benz wanted to test glass-fiber-reinforced plastics as bodywork material. Those were – and still are – few and far between. The coupe’s lightweight skin, opening up new possibilities in the aerodynamic design of sports cars, was bonded to a steel frame/floor unit. The second revolutionary feature of the C 111 was hidden under its skin. The first experimental car of 1969 was powered not by a reciprocating-piston engine but by a Wankel – or rotary-piston - engine. At the time, many manufacturers were interested in Felix Wankel’s unconventional propulsion system. Mercedes-Benz, too, had been experimenting with Wankel engines since 1962. However, the Wankel engine was to be extensively road-tested before being fitted in production cars. The last Mercedes with a rotary-piston engine from this series was the the four rotor unit of this C 111-II in 1970. The engine developed 350 hp and gave the car a top speed of 300 km/h. The C111 accelerated from standstill to 100 km/h in highly respectable 4.8 seconds. The development department of Mercedes-Benz eventually succeeded in solving the engineering-design problems involved in the rotary-piston principle, especially in engine mechanics, but the problem of the Wankel engine’s poor degree of efficiency, due to the elongated, variable combustion chambers of the rotary-piston principle, was not to be overcome with technical modifications. This problem was simply inherent in the design. The C111 program was dormant until 1976, when Mercedes started using the cars again - this time fitted with Turbo Diesel engines. The C111 and the C112 follow-up broke several speed records for Turbo Diesel cars. But that, as they say, is another story. The model you see here is a 1/43 by Märklin - part of a re-issue made in the 1990s. All of these were in silver, which kind of suits the car, though the original was in light orange. Also the wheels are different from the original Märklin Rak issues - these had generic “Superfast” type wheels. For this re-issue, the C111 received proper Mercedes alloys - though these were in fact not used on the original. But once again, they look the part. The model has a few interesting features. The Gullwings open, naturally, as does the engine bay. And the headlights pop up - via a lever at the back of the car. You can see it poking out on the photo above. Pull it, they go pop. Push it, they go down. Weird - why so complicated? And the headlights reveal Jewel headlights, like on all Märklin models. But this one has, count them six Jewels up front! I don’t think this has been bettered yet. The interior is very simple though, and like most models of that time, the emphasis is more on play value than on accuracy. 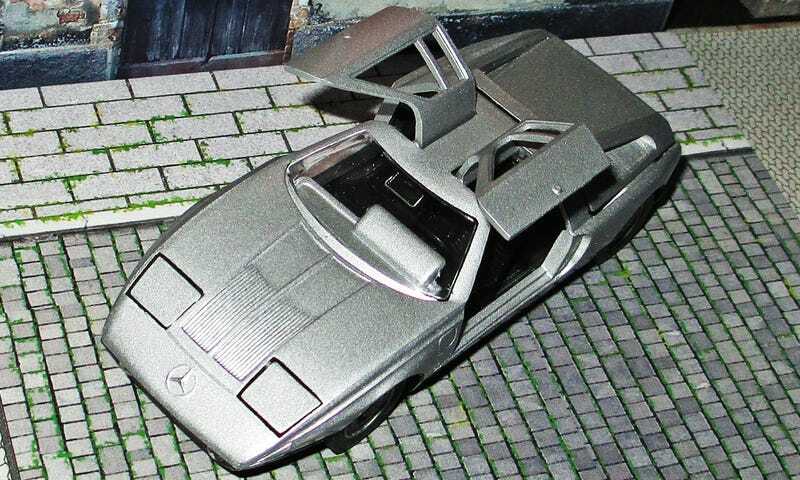 There you have it - another amazing 1970s Concept Car and a great piece of Mercedes Benz design from way back when. Truly a shame these never made it to production.